If you are looking to spend lazy days by the beach or sampling the local Greek cuisine, Kolymbia is a great choice. 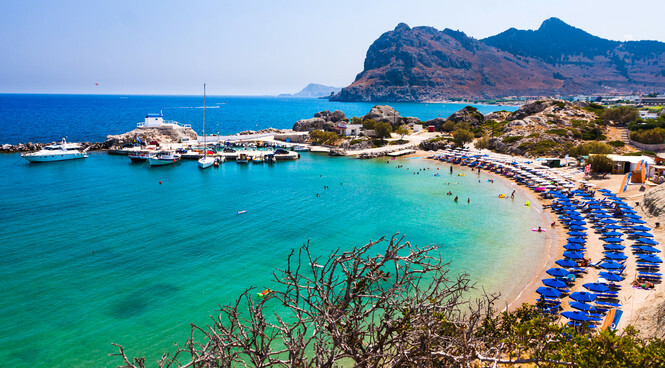 Positioned between the mountains and sea, halfway between Rhodes Town and Lindos, it has a fabulous beach for watersports, a small selection of shops and plenty of Greek charm. The main avenue, lined with trees, is dotted with cafes and tavernas leading down to the coast. This resort is well positioned close to the main highway so it’s easy to explore key attractions including the Seven Springs, Valley of the Butterflies, historic Rhodes Old Town or Lindos with its cobbled streets and white washed houses dotted into the hillside.If you are looking to spend lazy days by the beach or sampling the local Greek cuisine, Kolymbia is a great choice. Positioned between the mountains and sea, halfway between Rhodes Town and Lindos, it has a fabulous beach for watersports, a small selection of shops and plenty of Greek charm. The main avenue, lined with trees, is dotted with cafes and tavernas leading down to the coast. This resort is well positioned close to the main highway so it’s easy to explore key attractions including the Seven Springs, Valley of the Butterflies, historic Rhodes Old Town or Lindos with its cobbled streets and white washed houses dotted into the hillside. Along the main avenue of Kolymbia you’ll find a small selection of shops selling souvenirs, jewellery, handbags, arts and crafts. There is plenty to catch your eye and gifts to take home. There are several mini markets here too. At the crossroads on the main road is a supermarket with supplies to stock your kitchen cupboards and fridge back at the villa. Small traditional tavernas line the main avenue and at the seafront, you can choose one of the fresh fish restaurants with wonderful views – an excellent place to while away those balmy evenings. Alternatively, there are some very popular traditional restaurants within easy access by car – so why not try a tantalising Greek Meze? For serious fish-lovers the small fishing village of Stegna is just 15 minutes’ drive south. The whole seafront is door-to-door eateries offering their fresh catch of the day – bliss! You must visit the Ice Bar in Lindos, 30 minutes’ drive away, with a temperature of -6°C. It is literally the ultimate place to chill-out, offering a refreshing change to the hot outdoor temperatures. The beaches and coves of Kolymbia are perfect for taking a cooling dip or snorkel. Ten minutes’ drive south along the coast is Tsambika Beach, arguably the best sandy beach on the island, with the whitewashed monastery perched on the hillside above. You’ll find a large choice of water sports, paragliding, boat hire and a large inflatable play area tethered out at sea too. Sun loungers and umbrellas are available to hire, or even gazebos where you can be spoilt with waiter service all day long. North of Kolymbia, 20 minutes by car, is the fabulous Faliraki waterpark which claims to be the largest in Europe – a great family day out! Alternatively, children will also love the Toy Museum in Archipoli, with authentic Greek toys, dating from 1930 to 1990. Inland you can visit the Seven Springs, a beauty spot where you can see wildlife such as ducks and peacocks in their natural habitat. The more adventurous should explore the underground tunnel which leads on to a wonderful waterfall – the perfect photograph opportunity! On the West Coast, about 40 minutes’ drive away, visit the Ostrich Farm, and the Valley of the Butterflies, the perfect place to admire not only these fabulous creatures, but the flora and fauna. In Rhodes Town, 30 minutes’ drive away there’s an amazing 9D cinema, Throne of Helios. During the screenings rain, snow, wind, fire, earthquakes and even scents are experienced first-hand by the audience via special effects. It’s 30 minutes’ drive north to Rhodes Old Town, a World Heritage Site, and one of the best preserved Medieval towns in Europe. The Archaeological Museum of Rhodes is housed in a beautiful building and contains a number of finds from the island. Nearby, Mandraki Harbour is full of yachts and motor boats offering a range of excursions taking you down the coast or over to the nearby island of Symi. A 30 minutes’ car journey south takes you to the pretty village Lindos, watched over by the spectacular Acropolis, perched at the top of the hill. It can be accessed by taking the famous Lindos donkey taxi from the main square of the village – a splendid experience not to be missed! This authentic village oozes charm and with an abundance of shops, bars and restaurants, it truly comes to life at night! On the West Coast, 40 minutes’ drive away, is Kamiros, the third great ancient city of Rhodes, and another chance to reflect on the fabulous history of the area.